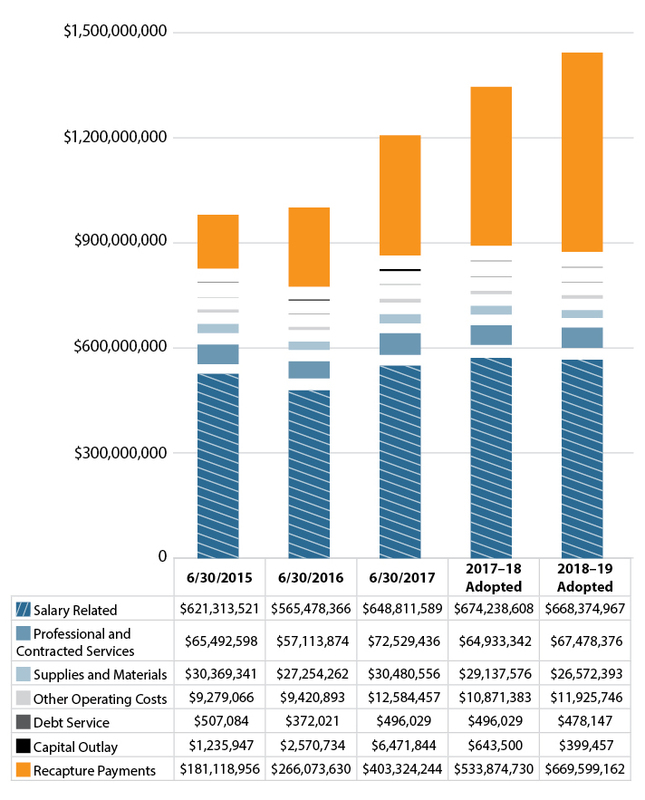 Austin ISD is committed to maintaining a transparent budgeting process. The budget is driven by the AISD strategic plan, which is the product of genuine consensus‐building and embodies the vision of our community. The AISD board of trustees established a policy that requires the district to maintain a minimum of 20 percent of operating expenditures in its general fund balance, which is also a driving factor in the budgeting process. AISD has earned the highest ratings for budget management from Moody’s Investors Service, Standard & Poor’s and Fitch Ratings. AISD also carries the highest bond and state financial accountability ratings that school districts can earn in the state of Texas. Maintaining transparency about the AISD budget includes providing financial information to the public. On this site, you will find a host of resources, including data on district revenues, expenditures, tax rates, cost drivers and comparative data with other school districts. Weekly Thursdays at 2 p.m.: Establish partnership among Finance, HR, Communications and Academics staff with weekly meetings. 08/01/2018–8/31/2018: Conduct budget training workshops for new principals and campus clerks. 08/13/2018–08/17/2018: Review financial policies to adopt budget in line with fund reserve and balanced budget. 08/27/2018: Board adoption of tax rates and exemptions. 09/03/2018–09/14/2018: CFO reviews and approves templates for department BTOs. 09/24/2018: Public hearing on school financial integrity results. September–August: Budget and Finance Advisory Committee monthly meetings to discuss current budget and gather community feedback on balancing budget. 10/14/2018–11/15/2018: Departments and programs work with the budget office to develop detailed spending plans. 10/22/2018: Budget office and HR work to develop budget and staffing formulas. Board approves budget development calendar. October–November, and as requested: Meet with Education Austin to discuss current budget and gather feedback on balancing budget. 11/26/2018: Board approves adjustments to staffing guidelines. Open in November: Launch online survey and other electronic communications to gather community feedback on compensation, benefits, budget, expense reduction and revenue ideas. December 2018: BSTF makes recommendations in line with its charge to the superintendent for his consideration and to share with the board for consideration in the 2019–20 budget and in out years. December 2018–January 2019: Conduct community conversations on the budget using both traditional methods and social media. Hold districtwide staff meeting to gather feedback on budget. 02/11/2019–02/22/2019: Budget department determines differences in projected revenue and expenditures. Budget works with Finance to determine Maintenance of Effort and PIC compliance. Provides analysis to senior leadership. 02/25/2019–03/08/2019: Senior leadership reviews and proposes edits to align expenditures with revenue. 02/01/2019–03/02/2019: Develop a strategic financial stabilization plan based on elementary, secondary, department, community and board feedback. 03/04/2019–03/06/2019: Elementary, secondary school BTOs budget development meetings with Budget, HR and federal programs. 03/08/2019: Elementary, secondary school BTOs returned to budget office for analysis. 02/01/2019–03/01/2019: Develop a plan of action. Describes the steps taken to implement the instructional priorities and money-saving ideas, along with responsible parties. 03/04/2019: Budget Department implements senior leadership recommendations into the Preliminary Budget. 04/22/2019: Board approves consultation agreement regarding the compensation and health benefits plans. 04/22/2019–05/01/2019: Administration refines budget as needed from stakeholder feedback. 04/22/2019–05/10/2019: Community outreach and presentation on preliminary budget. 04/30/2019: District receives preliminary certified estimate from chief appraiser for use in budget adoption. 05/06/2019: Board Budget Development Workshop No. 8: Presentation of the Recommended Budget and Multiyear Stabilization Plan discussion. 10–30 days prior to board meeting: Publish newspaper notice of public meeting to discuss budget an proposed tax rate. Also post proposed budget to district website. 06/17/2019: Board holds public hearing on proposed budget and tax rate. Board adopts 2019–20 fiscal year governmental funds budget. Amendments for 2018–19 fiscal year. 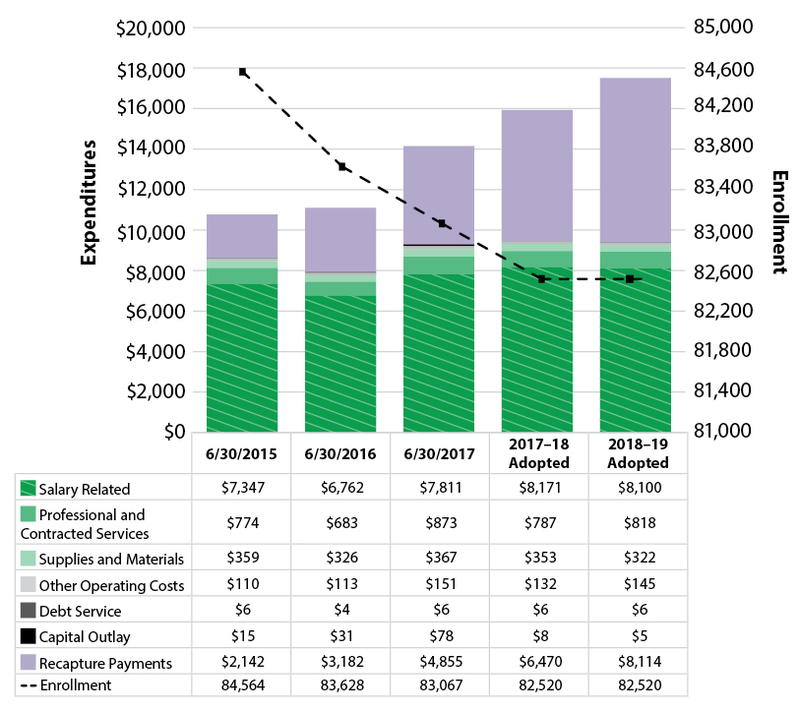 06/18/2019: District posts adopted budget on website and maintains for three years. 07/25/2019: District receives final certified appraisal roll from chief appraiser for use in tax rate adoption. 08/26/2019: Board adopts the 2019–20 fiscal year tax rates and exemptions. 11/18/2019: Certify tax roll for 2019–20 school year. Put strategies into practice and evaluate results. 08/01/2019–8/31/2019: Conduct budget training workshops for new principals and campus clerks. 08/12/2019–08/16/2019: Review financial policies to adopt budget in line with fund reserve and balanced budget. 08/26/2019: Board adoption of tax rates and exemptions. 09/02/2019–09/13/2019: CFO reviews and approves templates for department BTOs. 09/23/2019: Public hearing on school financial integrity results. 10/17/2019–11/15/2019: Departments and programs work with the budget office to develop detailed spending plans. 10/21/2019: Budget office and HR work to develop budget and staffing formulas. 11/18/2019: Board approves adjustments to staffing guidelines. December 2019: BSTF makes recommendations in line with its charge to the superintendent for his consideration and to share with the board for consideration in the 2020–21 budget and in out years. December 2019–January 2020: Conduct community conversations on the budget using both traditional methods and social media. Hold districtwide staff meeting to gather feedback on budget. 02/10/2020–02/21/2020: Budget department determines differences in projected revenue and expenditures. Budget works with Finance to determine Maintenance of Effort and PIC compliance. Provides analysis to senior leadership. 02/24/2020–03/06/2020: Senior leadership reviews and proposes edits to align expenditures with revenue. 02/03/2020–03/02/2020: Develop a strategic financial stabilization plan based on elementary, secondary, department, community and board feedback. 03/02/2020–03/04/2020: Elementary, secondary school BTOs budget development meetings with Budget, HR and federal programs. 03/08/2020: Elementary, secondary school BTOs returned to budget office for analysis. 02/03/2020–02/28/2020: Develop a plan of action. Describes the steps taken to implement the instructional priorities and money-saving ideas, along with responsible parties. 03/09/2020: Budget Department implements senior leadership recommendations into the Preliminary Budget. 04/20/2020: Board approves consultation agreement regarding the compensation and health benefits plans. 04/22/2020–05/01/2020: Administration refines budget as needed from stakeholder feedback. 04/20/2020–05/08/2020: Community outreach and presentation on preliminary budget. 04/30/2020: District receives preliminary certified estimate from chief appraiser for use in budget adoption. 05/04/2020: Board Budget Development Workshop No. 8: Presentation of the Recommended Budget and Multiyear Stabilization Plan discussion. 06/15/2020: Board holds public hearing on proposed budget and tax rate. Board adopts 2020–21 fiscal year governmental funds budget. Amendments for 2019–20 fiscal year. 06/16/2020: District posts adopted budget on website and maintains for three years. 07/25/2020: District receives final certified appraisal roll from chief appraiser for use in tax rate adoption. 08/24/2020: Board adopts the 2020–21 fiscal year tax rates and exemptions. 11/18/2020: Certify tax roll for 2020–21 school year. The Budget and Finance Advisory Committee provides guidance and counsel to Austin ISD administration. Learn more about BFAC. The Budget Stabilization Task Force is a key component of the district’s strategy to address its growing budget deficit. 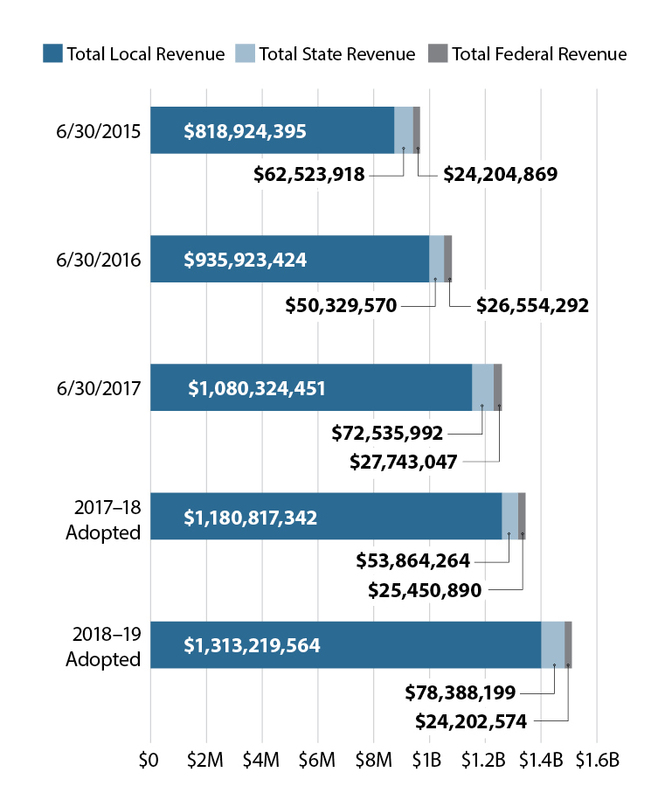 The ad hoc advisory body will meet every two weeks over the summer and into the fall to explore a broad range of actions the district could take to balance the budget in the next two to three years. Learn more about BSTF. The chart below shows that the majority of AISD's revenue comes from local tax dollars. Local revenue has increased 60 percent from June 2015 to the Adopted FY2018–19 budget. 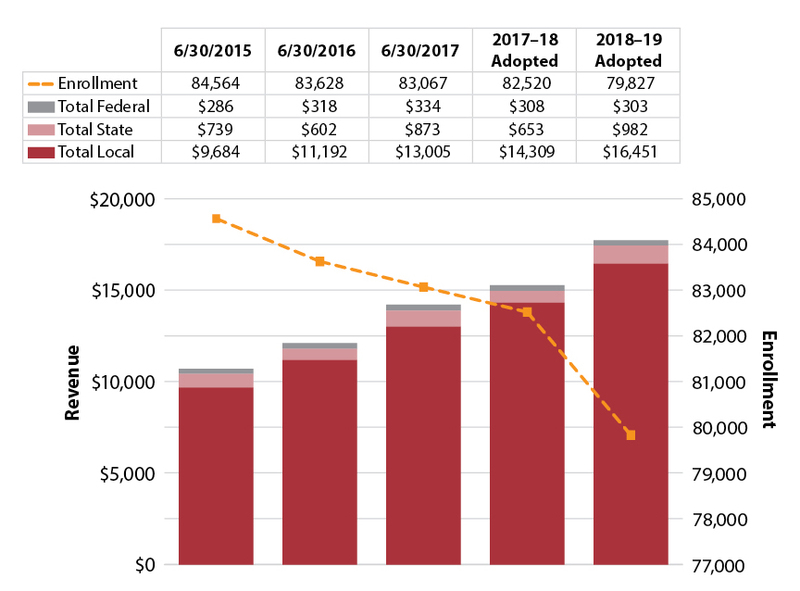 Student enrollment has been declining over the years with a significant drop between the Adopted FY2017–18 and FY2018–19 budgets. Despite student enrollment declining, revenue per student continues to climb with local revenue dollars driving the increase. In the five years shown, recapture payments have more than tripled. AISD anticipates this number will continue to grow each year for the next few years. Student enrollment has been declining with a significant drop between the Adopted FY2017-18 and FY2018-19 budgets. Despite student enrollment declining, expenditures per student continue to climb with recapture payments driving the increase.